A properly cared for pet tarantula can live longer than a dog or cat. Female tarantulas have longer life spans than males, and certain tarantula species make better pets because of their non-aggressive, docile temperaments. Many tarantulas are brown, while others are multicolored. 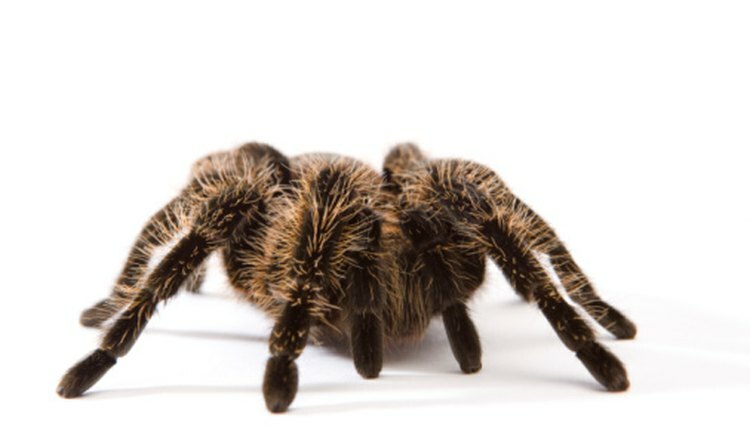 If you are thinking of adopting a pet tarantula, bear in mind that it is going to be around for quite a long time. This tarantula is referred to as the "Oklahoma brown" or the "Texas brown" because of where it is found. The brown tarantula has a leg span that is 4 to 5 inches long, with hairy legs in various shades of brown. It is one of the more docile species of pet tarantulas. The brown tarantula has a long life span. It reaches maturity in 8 to 10 years. The male lives 7 through 12 years, while the female lives up to 36 years, if cared for properly. The Chilean rose hair is another of the docile tarantulas and makes a good pet (as tarantulas go) because of its calm disposition. Its adult leg span is 3 to 5 inches, and the females are bigger than the males. The female Chilean rose hair tarantula lives up to 20 years, while the male of this species only lives 4 or 5 years. This tarantula has a hairy, black abdomen and legs that range from orange to dark red-orange. The leg span of this tarantula is 5 to 5.5 inches. It has a nonaggressive, docile temperament, which makes it very popular as a pet. The Mexican red knee has become endangered because of the pet trade and destruction of its endemic habitats. The males of this species live up to 10 years, while the females can live up to 25 years or more. The Brazilian black tarantula has been dubbed the “best pet tarantula” because of its docile temperament. It is a striking jet black, has a leg span of 5 to 6 inches and is more active than the other types of pet tarantulas. It is also more expensive. Female Brazilian blacks can live up to 20 years, but the males have a significantly shorter life expectancy.